The library service in Solihull has been working with ReCom, a local charity whose aim is to help more people benefit from getting online. They help individuals, the community and organisations benefit by running Computer Clubs for the over 55s, and offering IT training to charities and community groups among other things, all with the goal of bringing people closer to employment. These goals meant they were therefore a good partner to work in the library. Their programme in the library specifically looks at working with jobseekers and the majority tend to be those who have been out of work for more than 12 months. Participants in their programme also tend to be more men than women, and include more over 50s than other ages. Looking at a recent quarterly report, demand for the service is growing steadily: for example 50 new referrals accessed the one to one job search appointments over the previous 3 months, across all 3 libraries that were taking part (The Core, Chelmsley Wood and Shirley libraries). They also offered a general computer skills course for 5 learners and have commenced another NOCN Level 1 course which gives more people the opportunity to achieve a qualification. During April-July 2016, they offered in total 598 appointments providing one-to-one support - and gathered feedback which included: "I found the service really useful and the Buddy was very patient and supportive", "I feel my computer skills have really improved, that’s why I am confident to attend the group job search sessions now", and "I now have a job as a labourer thanks to the help I received from ReCOM. If I was unemployed in the future, I would definitely come back and use the service." Most positive of all, 11 people secured employment that quarter. set up a Universal Job match account and had assistance on how to use it. Paul is really keen to improve his IT skills so the team at the library suggested he join a Silver Surfers class. This has enabled him to use this time to concentrate on the various software packages including Word, Excel and email, and to use the Job Seekers project to continue his search for employment. Paul is enjoying the course and feels that he is getting a much better understanding of IT. enhanced her confidence with using the internet and registered with various job search websites. Ruth has attended 9 one to one job search sessions and is now participating on one of ReCom’s accredited courses, a NOCN qualification in Using Email. And finally Ian Owen, who has been working with ReCOM at Chelmlsey Wood Library for the past 12 months and is another person who was long term unemployed and referred by the local Job Centre. During his time with ReCom, he has really improved his computer skills and has enhanced his confidence with job searching. 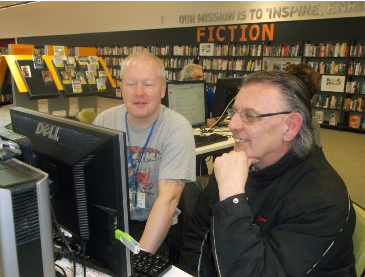 Ian has completed 20 one to one sessions with ReCOM at the Library to support his job seeking and has been invited to 6 interviews. Ian feels that, since he has been having assistance, he is now getting results. He has just been offered the opportunity to complete pre-employment training for Argos in the hope of starting employment in their warehouse. As these stories show, working with a partner long term in the library can deliver real results, helping people develop trust and confidence, and enabling them to fulfil their potential.